Oxalates (oxalic acid), tannins, anthracene derivatives: emodin, chrysophanol, rhein , glycosides, hyperoside, quinoids, phenylpropanoid, flavonoids, quercitin-3-D-galactoside. 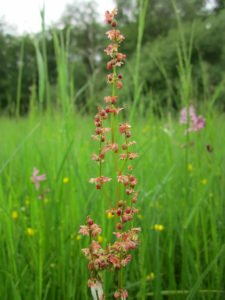 Sheep’s Sorrel should be avoided in patients with kidney stones due to its high oxalic content. One case of toxicity in a human has been reported for Sorrel soup. Caution with anyone undergoing conventional chemotherapy due to the potential for herb-drug interactions.